or can be downloaded from the SpartanNash Facebook page. GRAND RAPIDS, Mich. – To continue its efforts to fight hunger in the communities where SpartanNash associates live and work, the SpartanNash Foundation – the company’s charitable giving arm – recently made a series of $5,000 donations to 14 food pantries in 13 states. In total, $70,000 was donated to community food pantries located near SpartanNash’s food distribution and MDV distribution centers. Each SpartanNash distribution center selected its partner pantry, ensuring the financial support would have a significant local impact. 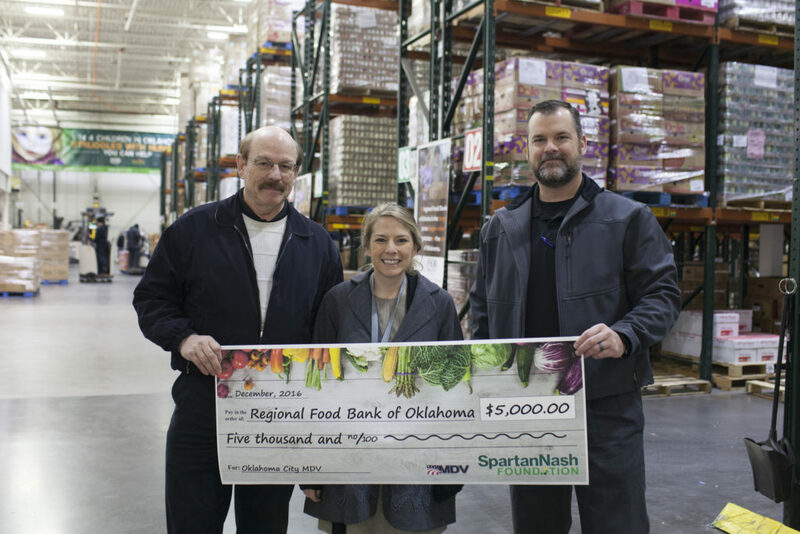 On Dec. 14, 2016, SpartanNash Human Resources Manager Dennis Glover and Senior Distribution Director Todd Payne presented a $5,000 donation to Olivia Townsend, Manager of Donor Relations at the Regional Food Bank of Oklahoma. In total, the SpartanNash Foundation donated $70,000 to community food pantries located near SpartanNash food distribution and MDV distribution centers. For the past 12 years, the SpartanNash Foundation – and its predecessor the NFC Foundation – has supported local food banks during the holiday season, giving each SpartanNash distribution center the opportunity to personally select its partner pantry and provide food for those who need it most. Since 2004, the company’s distribution centers have donated nearly $1 million to community food bank and pantry partners. SpartanNash distribution centers also support their local food banks throughout the year by donating food items and other goods. In 2015, SpartanNash donated 2.58 million pounds of food to food banks, churches, schools and other organizations serving those in need in our communities. In September 2016, the SpartanNash Foundation also hosted a companywide scan campaign to end hunger. Store guests and company associates who visited any SpartanNash corporate-owned store during the 12-day retail scan campaign had the opportunity to donate $1, $5 or $10, with 100 percent of dollars raised going to support community food pantries and food banks. The scan was the most successful companywide retail fundraising effort to date, raising nearly $300,000 on behalf of more than 100 local food pantries. Through the scan campaign to end hunger, the SpartanNash Foundation also provided $60,000 in donations to community food pantries located near its distribution centers in Fargo, N.D.; Omaha, Neb. ; and Grand Rapids, Mich.